The 41-mile drive on NF-8020/Cooper Mountain Road from Chelan, WA to Summer Blossom Trailhead was much less attractive than the trailhead name itself. Compared with the similar in distance drive to the Entiat River Trailhead, this rough approach was as different as night and day. 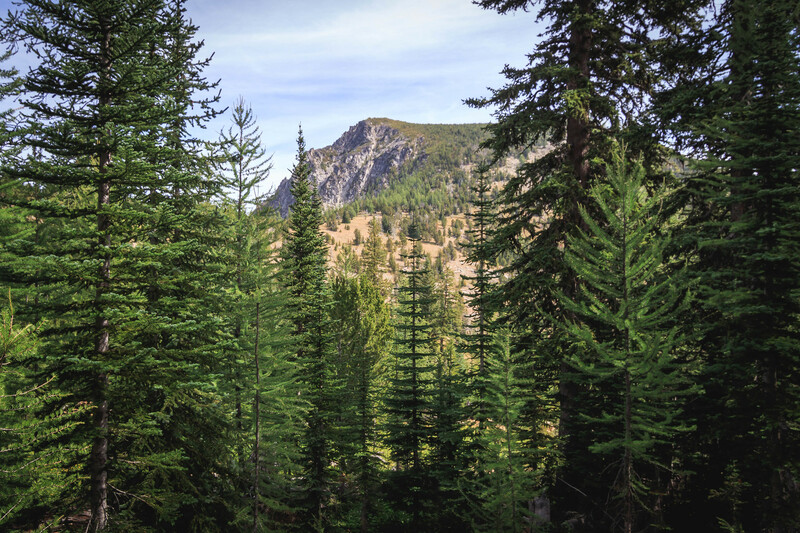 Service road rose steadily in lower elevation, then hugged lower Sawtooth Ridge higher up while bypassing several high points from either side of the ridge crest. Despite the deeply rutted sections in the last few miles on Cooper Mountain Road, we managed to make it to and back from the trailhead in a low-clearance vehicle. The estimated 2.5-hour drive one way in map ended up taking one extra hour in practice. Having burned a ton of fossil fuel on the way up, I had serious doubts about making it back to Chelan before emptying out the tank. But glad it wasn’t the case. Pup and I started hiking late morning on the nicely maintained Summer Blossom Trail. We had hiked the northern terminus of this trail one month ago through Deadmans Pass, the weekend before my trip to the Northern Picket Range. Before long, we were standing on Navarre Pass, 150′ below the summit. Highest point of the summit had some trees blocking the views. But the east end was wide open. 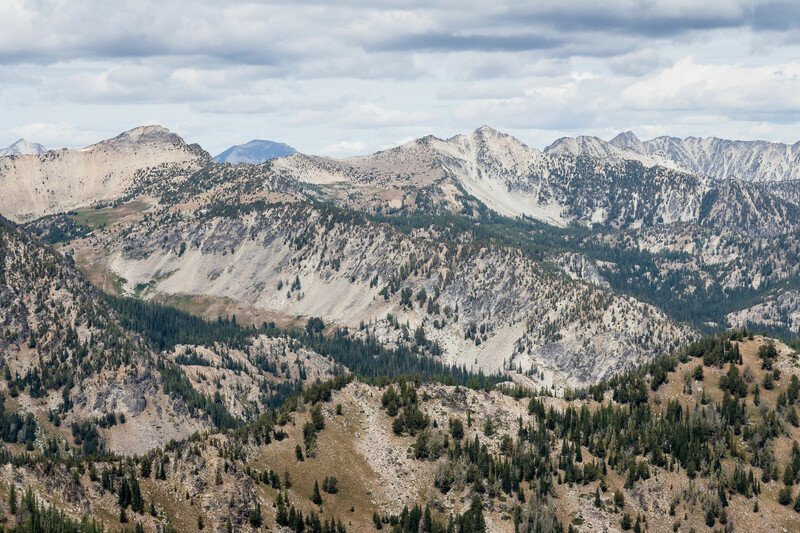 This broad summit offered great views into the long running Sawtooth Ridge to the north, as well as views to the northwest of Merchants, Horsethief, and Safety Harbor Basins. North and east faces of South Navarre Peak looked especially daunting from this angle. We enjoyed a long summit stay. Since it’s still early in the day, I decided to pick up Bryan Butte on the way out to make the long drive worth while. Back the way we came at 6,600′, we left the trail at the sharp bend and moved northeastward in the meadow near head of Falls Creek Basin. 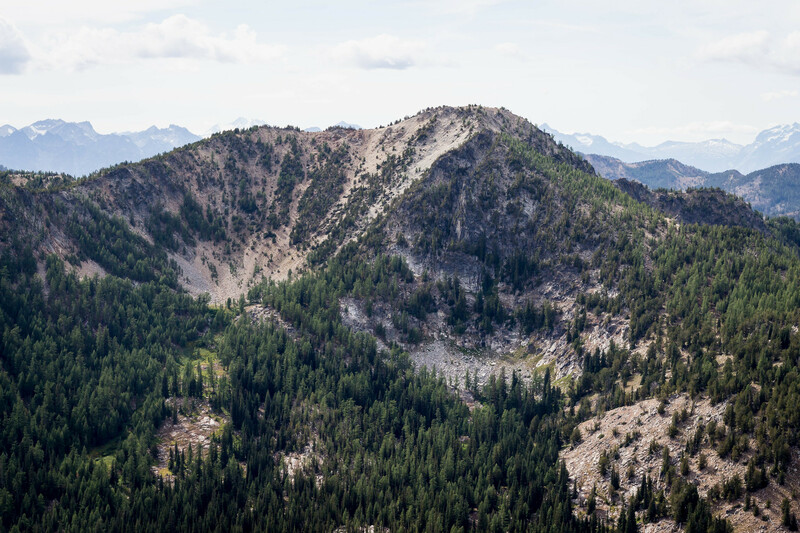 From 7,200′ we ascended by hugging right of the southwest ridge crest on steep terrain. 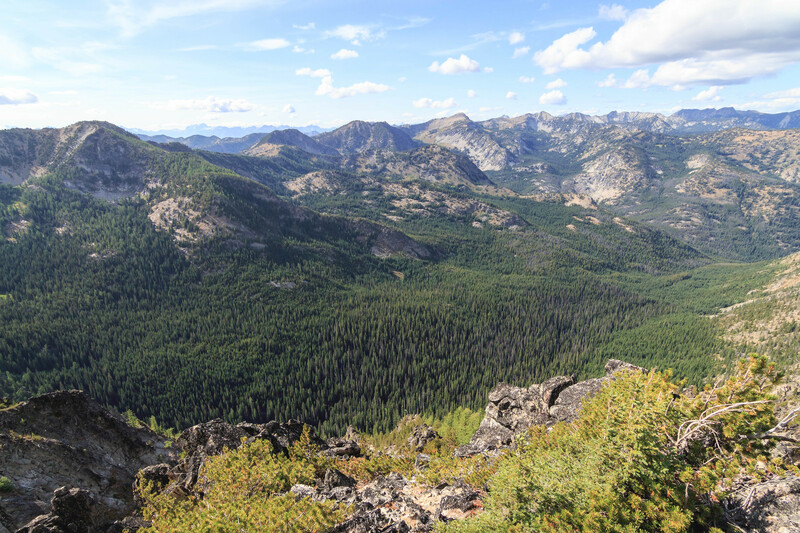 After fighting through dense growth from 7,000′ onward, it was a relief to find the boulder-stacked summit with a large 180-degree opening into Merchants Basin and rest of the Sawtooth Ridge. Being farther away from taller summits to the north, views up here were not as dramatic. We stayed just long enough for snacks and photos. On the drive back down to Chelan we spent more time negotiating the ruts. Low fuel warning light came on before we got halfway down the ridge, so I kept my emergency device handy just in case. But thank god we made it back to the city before getting stuck for real!